Bear fans will have to be content with their team’s up-and-down performances in the first three preseason outings. Tonight’s game in Cleveland will do almost nothing to change their outlook, because starters barely ever play in the fourth exhibition game. But that doesn’t mean I can’t waste some words on it! FUHBALL! -We’ve got two safeties that are essentially out of the race for the starting jobs. Adrian Wilson was cut over the weekend, so he’s as gone as it gets. The other is Chris Conte, who won’t play tonight as he hasn’t been cleared for action following his concussion last week. Conte might make the roster (for whatever reason), but he can’t be legitimately proclaimed the starter. Ryan Mundy and Brock Vereen seem to have the inside track on the starting gigs, but what do I know? Safety play is too difficult to scout for a home viewer. -Tonight I’d expect to see a healthy dose of Santonio Holmes on the field. Holmes’ resume is enough to warrant a roster spot with the receivers not named Brandon or Alshon on this team, but he needs to get more game reps in this offensive system. -In a rare non-Bears preseason note, we’ll all get up-close and personal with Johnny Football tonight. Last week he flipped the bird (on camera) and was caught on camera AGAIN as he was told his violation hit the airwaves. I can only hope he DX-crotch-chops someone tonight. -Hey! 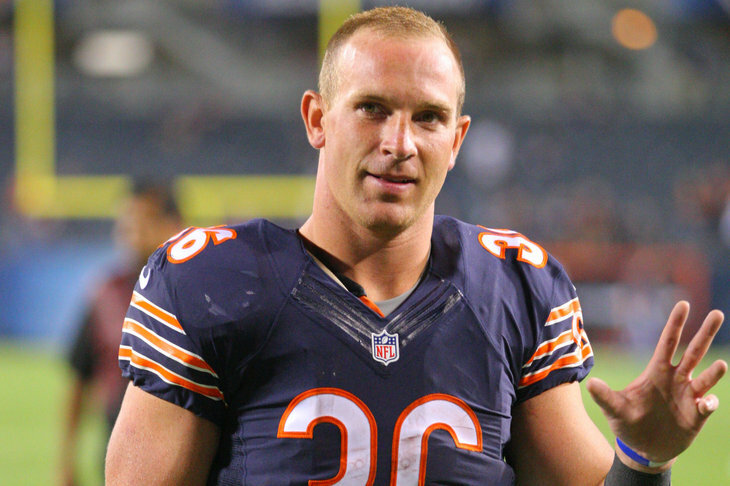 Remember that Jordan Lynch kid we signed from whatever-Illinois university? The one that used to be a running quarterback in college and the NFL was all “no way you’re a QB dude?” Well you’ll get to see a ton of him tonight as he tries to earn a roster spot as a running back on the Bears’ roster. We should all expect his release by Friday afternoon. -Speaking of, the Bears will be cutting 22 players to get down from 75 to 53 by 4PM ET Friday afternoon. There will likely be a little fine-tuning as other teams cut big name players, but the roster as it stands after final cuts will be very close to the opening day version. Tonight’s the night for those 22 players to fight it out for the few roster slots that are even up-for-grabs. The field will be covered in the blood of lesser men! Or something to that effect. Any questions? Enjoy the final chapter in 2014’s Scrub Wars!